Boston, MA – On December 19th, members of our community joined forces with the Chinese Progressive Association for a rally in support of passing “An Act to Prevent Wage Theft and Promote Employer Accountability”. Several elected officials were present at the rally including Boston City Councilor-Elect Kim Janey, Boston City Councilor-Elect Ed Flynn, and Representative Michlewitz. These legislators marched with attendees and voiced the importance of passing the bill during the current legislative session. 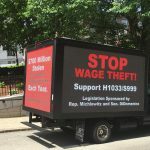 Want to help put wage theft to an end in Massachusetts? Spread the word on this important bill immediately by contacting lawmakers and sharing this video with friends and family!